The best thing about teaching is the opportunity to create human contacts with your students, which act like bridges to convey notions and information about the language they wish to study. 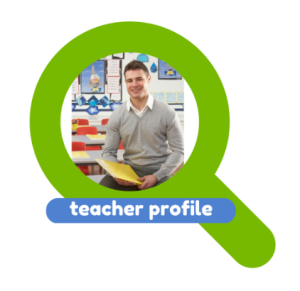 I reach my goals as a teacher when I manage to build these connections by respecting the students’ needs and personalities, and I can see significant results in their language skills. A teacher must be able to make students love the language they learn: this is the fundamental rule of my teaching style. Of course, strong knowledge and competence of the teacher are indispensable to reach this result. I have had many experiences as a teacher so far, and what I discovered is that you have the chance to build the right connection with every kind of person you meet. The teacher must have the ability to recognize the best approach to be used with each of them; in order to do this, I think the best way could be having a preparatory meeting with the student. Through this, the teacher has the possibility to settle a proper linguistic and grammar plan based on the student’s needs and wishes. And s/he can speak with him/her, in order to establish a relationship founded on mutual trust and respect. Students must have the impression that the teacher is giving his/her best effort to make them improve their language. As well, the teacher must have the ability to make language interesting and keep boredom away from the lessons. Language is a living thing, and so the perfect lessons should be. I believe to own quite a good intuition. This allows me to build the connection with my students, which I have written about so far. In my years of experience as a teacher, and of course through my entire studies I acquired the “technical” preparation which is primary for a good learning. I studied how to teach Italian to foreign students, I developed by myself a project in which I taught Italian to foreigners by visiting a museum in Bologna; I have studied English since my middle school days until now, and I still dedicate to it with passion and creativity. I like talking with my students, find out much about them. This empathy, my experience and the studies I have done make me confident in teaching. I am currently working in a school as a foreign language assistant since September. I have experience from working as a foreign language assistant for one year in Liverpool. I was also a private tutor in my home country, France. My job as FLA was /is to prepare GCSE and A-level students for their exams. Using an example of their exam board, adapting it to each students’ strengths and weaknesses, I first go over what they already know, consolidate their knowledge and from there, move on to the more difficult aspects of language. In each session I incorporate an element of French culture, so that they don’t simply learn a language but the culture as well. In my year as a private tutor (for the French tutoring agency Acadomia), I have had a few adult learners and I have applied this process to them as well, with a few tweaks here and there. The main reason is because they decide to learn French for more specific reasons and I always adapt my lessons according to their need rather than an exam board’s. If they need to learn business French, I make sure to change my lessons so that even examples of sentences may be used by my students. I also research what I need so that I can give them as much information about the field they are targeting. As for homework, I always try to include fun ones, using audio files and videos to work on oral comprehension and production. It is not enough to know the grammar, it is essential to be able to understand the spoken language, especially since French is tricky in terms of speaking/spelling. What makes me a great teacher is that I care about my students. I am interested in why they want to learn, how they feel about their learning and make sure to know if we are moving too fast for them. I am patient, Rome wasn’t built in a day, and I am creative, both in my lessons and in my approach to any problems. I always find different was of explaining a point. I am adaptable, and I often put myself in their shoes to understand what gives them a hard time. I am friendly, approachable and I never judge. I also know when to push a student and when to stop, when to congratulate them and encourage them.